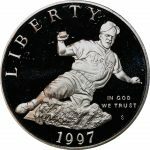 1997 S Jackie Robinson Proof Silver Dollar Commemorative. The Obverse features Jackie Robinson sliding into base with a puff of dust surrounding him. The Reverse in the center has “Jackie Robinson 50 years”. Also the words “Rookie of the Year 1947” and “Hall of Fame 1962” Complete with box and certificate of authenticity.